Edit, trim, cut, record, split, apply effects and filters. 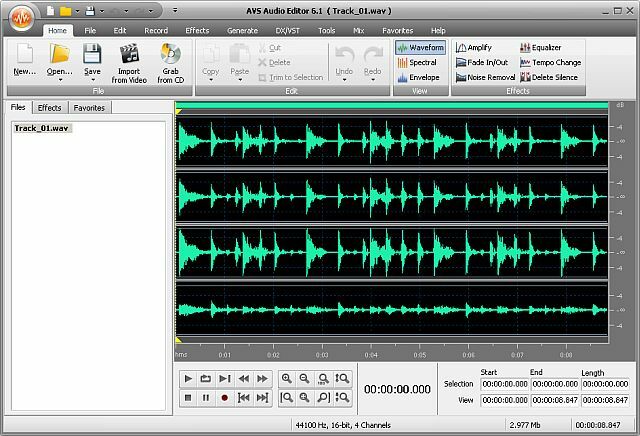 Edit, save your audio in popular formats with AVS Audio Editor. Search and delete irritating noises with over 6 intelligent filters. Edit audio directly in your video recordings. Create a unique ringtone for iPhone. AVS Audio Editor is a part of AVS4YOU.com package. Register once at avs4you.com and work with all tools from the AVS4YOU.com package. Subscribe for $39/year or $59/lifetime. *Cut, trim, split, merge audio.Apply various effects and filters. *Use Timeline for maximum precision. *Use batch editing to apply certain settings to several files at one go. *Smooth unwanted hiss with Noise Reduction filters. *Edit an audio track and create your own ringtone for iPhone. *Work faster - make up a Favourites panel with the most frequently used functions. AVS Audio Editor is a part of AVS4YOU package. Register once and work with more than 20 tools from the AVS4YOU.com. AVS4YOU tools let you easily rip, convert and edit audio/video files, burn DVDs, create ringtones, upload videos to portable devices, players, phones and much more! Qweas is providing links to AVS Audio Editor 7.1.3.444 as a courtesy, and makes no representations regarding AVS Audio Editor or any other applications or any information related thereto. Any questions, complaints or claims regarding this application AVS Audio Editor 7.1.3.444 must be directed to the appropriate software vendor. You may click the publisher link of AVS Audio Editor on the top of this page to get more details about the vendor.